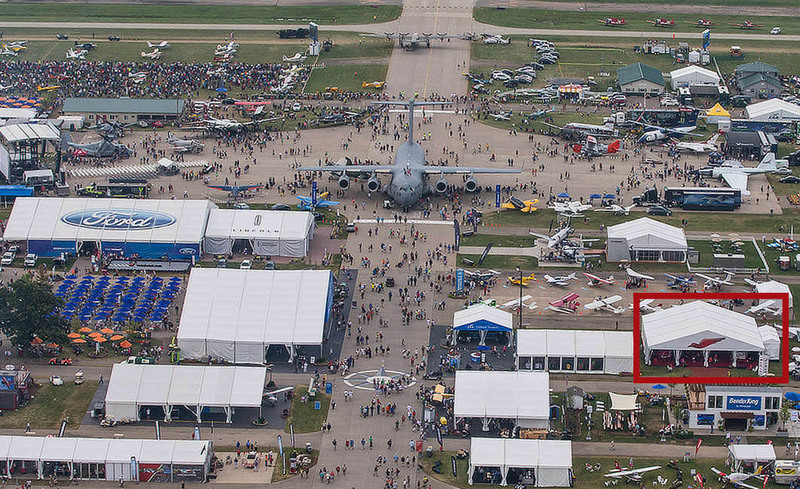 Later this month, we’ll all make our annual pilgrimage to Oshkosh, WI for the World’s Greatest Aviation Celebration. AirVenture 2018 is slated to have a multitude of sights and attractions showcasing aviation’s past, present, and future. With all the amazing features on the grounds, it can be challenging to navigate to everything you want to see! For the latest innovations in flight training, just look for the red bird. 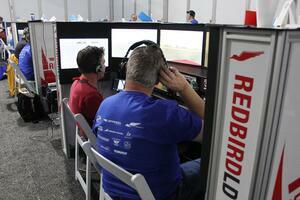 Redbird flight simulators will be featured in various locations across the AirVenture grounds. There will be a ton of opportunities for attendees to check out Redbird technologies, meet our team, and learn about our latest initiatives to move flight training forward with innovative, reliable, and high-quality products. To make sure you can find us, use these three ground references to maneuver your way to a Redbird. Product and Usage Updates – Recent product updates and FAA rulings have expanded possibilities for your flight training. Our operating system, Navigator, just got a lot more powerful. A year after its release, GIFT is ready to revolutionize instructional design. On top of that, your Redbird Aviation Training Device now can be utilized even more heavily in your training. 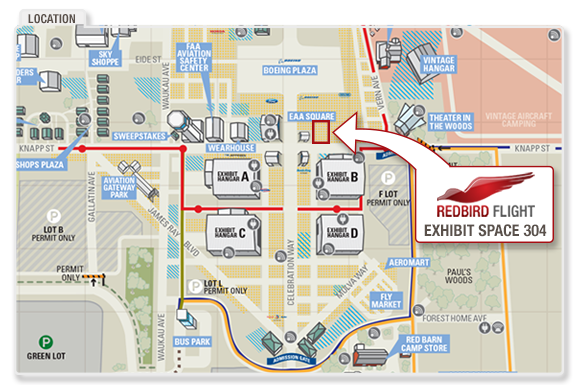 Visit the Redbird tent to discover what it all means for you. The Return of the Redbird STEM Lab – On the heels of a successful AirVenture in 2017, the Redbird STEM Lab took to the road this year. Now featuring the new Redbird STEM curriculum—which consists of six lessons and corresponding, preset flight missions—the STEM lab returns to Oshkosh this July to showcase the classroom of the future. Utilizing Jay Velocity simulators to integrate science, technology, engineering, and mathematics (STEM) into aviation-themed classes, the Redbird STEM Lab is a can't miss, interactive experience for students in grades 6-12. The STEM lab will take place Monday, July 23 through Saturday, July 28 in the Redbird Tent. View the complete course offerings and register here. We'll also be showcasing a very special edition of the Redbird CRV Full-Motion Advanced Aviation Training Device, our Cessna Caravan simulator. We won't give too much away, but this sim does things you've never seen a Redbird do before—in your flight school or in nature*. *Redbird is not liable for any false information regarding the anatomy or behavioral characteristics of birds. For more information, please consult a wildlife expert or get more into bird watching. To schedule a test flight in one of our training devices, fill out this brief form. The EAA Pilot Proficiency Center is one of the most unique and important parts of the show. Dedicated to improving pilot skills and enhancing safety, the Pilot Proficiency Center features 14 Redbird LD ATDs and the Redbird Xwind. Each sim is staffed by a professional flight instructor who will guide pilots of all levels through a pre-flight, two or three flight scenarios, and a debriefing. Pilots can check out the scenarios here. Last year, our P-51 Mustang simulator—modeled after Bud Anderson's famous "Old Crow"—was a huge hit in Warbird Alley. We knew it was pretty cool when Bud Anderson actually stopped by to fly it! Well, Warbird Alley, we'll have another surprise for you this year. Unveiled Monday, July 23, and available to fly throughout the event, this device pays homage to one of our favorite stories in military history. You won't want to miss it. 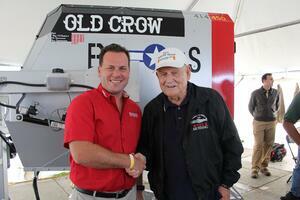 Our friends at AOPA are featuring Redbird TD2 and Jay Velocity simulators in their tent this year. Stop by to do some flying and to learn more about the important initiatives impacting the future of general aviation.